When we were camping at Lake Havasu in January this year, I saw this centerpiece on a picnic table. 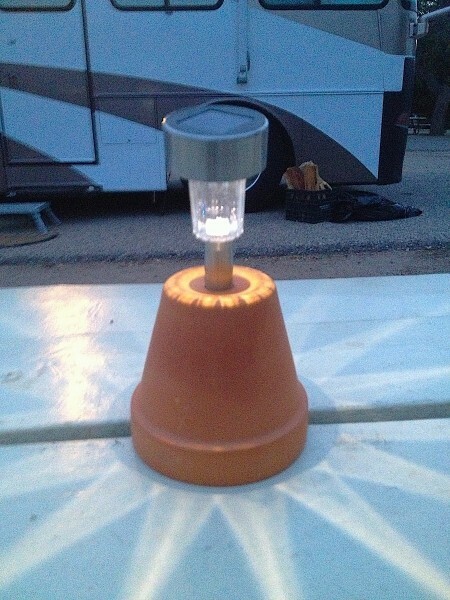 It’s an inexpensive solar light that has been mounted on an inverted terra cotta pot. It is utilitarian, but it provided a lot of light at that picnic table that night. I have been trying to find a pretty way to have a solar lights at the campground. I had made some hanging solar lights, but the wind damaged half of the eight that I made, so I gave up on them. I then put them into a candelabra, but the wind knocks it over as well. The terra cotta planter is impervious to the wind, but it’s not very pretty. I’m still trying to find a way to make a beautiful solar lamp for camping that won’t blow away in the wind. When I find it, I’ll share it with you. What about a Mason jar for the anchoring bottom? Or maybe a Starbucks bottle? The Starbucks bottle woUld need a weight but the mason jar should be ok. I like the terra cotta pot and the candelabra. The candelabra, you could add maybe a terra cotta potbase to the bottom to weight it, or a pretty rock. The pot could be painted, stenciled, etc. Great idea! Decorate the terra cotta pot… paint or do some mosaic with broken tile pieces? The gal above mentioned mason jar — fill one with different colored sands, drill hole in the lid for the solar light..that would add the weight (and of course use a larger jar) — could maybe even use a pickle jar as they are a little bigger. Just a couple thoughts. Just paint the terracotta planter with glow in the dark sparay piant. it looks awesome! I would paint the pots with pretty colors or designs, spray with outdoor sealer and voila a pretty light holder! I think these would be pretty in the yard as well, if the pots are painted. Colorfully paint and cut pvc pipes and use them as stands for solar lights. Garnish the pot with some trailing ivy plant, or the mason jar idea above with clear marbles would add glitter. Why not take pictures from your camping trips and decoupage them on the flower pot….you could always collect sea shells and decorate the flower pot or sand and sea shells in the mason jar. Such good ideas! Thank you everyone! You made my day!!! You can get these solar lights at the DollarTree store! Did you know they make some stuff called earthquakeputty? Put some of that in the bottom of your candelabra, and they will stay in place… just thought you might like to know. If you don’t live in or visit a place that has earthquakes, you can use the putty for sticking things to the walls. Hope this helps in future endeavers. Love the idea of the pot too!!! Have have several mason jars with the solar lights glued on the lids on my back deck. Inside the jars I put colorful glass stones. Very pretty when lit up. I think I am going to try the terra cotta pot next, but paint it first, or the mosaic tile is a good idea. The clay pots for your solar lighting would look awesome with some broken mirror glued to the surface and then grout to fill in the spaces like a mosaic. You could turn the pot right-side-up and fill it with dirt and an attractive plant. Then stick the solar light into the dirt. Paint the pot if you wish. Something rustic for camping…How about an log of wood with holes drilled in it to stand the lights in. A longer piece with several holes and lights would make a nice center piece for the table or several for a walk path. Heck, I’m thinking flowers, trailing or otherwise, and pop a light in the middle. Maybe some herbs to help w/ the mosquitos? -Angela had a good idea. Use a small log. Drill holes in it to place the solar lights in. Flatten the bottom to hold it upright. This will not break & goes with the outdoor theme of camping.